Here’s the Lois Lane-centered follow-up to my earlier Clark Kent post. In the traditional setup, Lois sees Superman as a perfect specimen of … well, anything; and Clark is just some nebbish she works with. Back in the day, the stories tacitly affirmed her behavior, because why wouldn’t she have gravitated towards Superman and brushed off Clark? Today she tends to look pretty superficial, which in turn gets countered with the notion that Superman must have seen something pretty special in her. That then might make her something of a trophy for him, so I’ll try not to dwell on his perspective. In this respect, I think Superman Returns might have artificially distorted the traditional Clark/Lois dynamic, producing atypical, but understandable, results. In the first two Christopher Reeve movies, Lois and Clark aren’t all that close, not even by the time of their Niagara Falls trip in Superman II. So when Superman and Clark both come back into her life, naturally she focuses on Superman, because he’s made the biggest difference. Clark’s just some guy. We’ve all known someone, whether at work or school, who we see every day, to whom we are friendly and vice versa, but whose 5-year trip to Outer Mongolia wouldn’t make a ripple in our daily lives. That’s Clark to Lois in the Reeve/Donner/Singerverse. In the comics, and even on “Lois & Clark,” the week-to-week schedule can show the relationship(s) growing and developing. This was the approach when they started dating in the late ’80s and early ’90s (they got engaged in late 1990, and he “came out” to her in early ’91). Otherwise, a static take on the triangle just reinforces the extremes of Lois cuckoo for Superman and just friendly to Clark. Therefore, when no gradual development is (or can be) shown, it’s not unreasonable to think that Lois sees very little in Clark beyond the stereotypical nice guy, and we all know where nice guys finish. Also, Movie Lois’ indifference sets up her learning the secret in Superman II. In the original release, Lois’ suspicions appear to be quashed, but dumb luck intervenes and Clark falls into a fireplace. She’s vindicated, but her still-fresh humiliation takes some of the triumph out of it. Not so in the “Donner cut,” where Lois shoots a freaked-out Clark and gets additional pwnage by revealing she was shooting blanks. In both instances Lois pursued Superman with an investigator’s zeal, and doesn’t look shallow or petty; but I think the Donner version lets her keep more of her dignity. Speaking of which, one take on the relationship holds that, upon learning the truth, Lois should reject Clark/Superman for, essentially, lying to her all those years. In the Mad parody “Superduperman!”, Bark Bent (right?) grovels along behind a completely oblivious Lois Pain, who calls him a creep; but when Superduperman tells Lois his secret at the end, she stuffs him in a trash can and stalks off: “Yer still a creep!” Again, without some development in the relationship, Superman/Clark continues to look like a tool for stringing Lois along. Thus, it seems that for Lois and Clark to work as a couple, Lois must overcome her perceived superficiality in the reader/viewer’s eyes, and Clark must convince the reader/viewer that he’s not just making her look stupid. Again, the movies make Lois appealing through a few deft strokes (including pounding that champagne bottle on Perry’s desk, which facilitates Clark’s perfectly innocent line “Why would anyone want to make a total stranger look like a fool?”). We can see why Clark/Supes falls for Lois, because we like Lois ourselves. When she learns the truth in Superman II, I suppose she’s already made peace with his secret identity, and therefore worked through the desire to reject him. It’s similar to her being starstruck on the terrace in the first movie. She mentions Clark’s dismissal of Superman as a figment of someone’s imagination, like Peter Pan; and Superman replies, “Peter Pan flew with children, Lois, in a fairy tale.” In other words, the revelation of Superman’s secret is just another impossible thing to assimilate. Therefore, his SR absence makes her less charitable towards him. She’s dealt with you-know-what pretty well, and I would even say that their roles are reversed, with him caught off-guard and her in command of their relationship. I do think SR adopts the notion that their relationship is the bellwether for his relationship with humanity at large. Accordingly, by the end, he’s comfortable enough to assure her (and us) that he’s not going anywhere. Of course, this brings up the reason he left in the first place; namely, to verify that Krypton is, like Generalissimo Francisco Franco, still dead. When he left, apparently he was confident enough that their relationship could survive, and there was also the possibility that he’d find more Kryptonians. (They’d likely be good Kryptonians, because they wouldn’t be in the Phantom Zone.) Discovering a completely dead Krypton was one thing, but coming back to a significantly changed Earth (personified by Lois) was a double whammy. Getting back to Superman’s point of view for a bit, though, there is a strong thread running through all the iterations that Superman not only feels a responsibility to use his powers, he has a need to use them. Superman needs to be able to relate to Lois not just because she represents humanity, but also because he doesn’t know how to relate to her solely as “normal” Clark. (SR never really puts forth the Milhouse-like Jimmy Olsen as a substitute, which is both a missed opportunity for comedy gold and further support for my Lois theory.) In fact, one of the film’s most exultant moments is the Smallville flashback, where Young Clark apparently goes from simple super-leaps to actual flight. This is before Clark became responsible, of course (remember the first movie’s “is a bird showing off when it flies?”), and also before he meets Lois. I don’t know if there is much of a connection, but perhaps she does inspire him to be more responsible. She probably does now, at any rate. Today, with the two married and Lois fully able to participate in Clark’s life, it seems like the relationship is as healthy as it’s going to get. Not only is the marriage the product of a steady progression of stories, the characters’ relationships don’t have to deal with the artifice of a “fictionalized” Clark Kent. Having Clark be the real person and Superman the persona makes it easier for Lois to relate to both of them, because it’s less of a learning curve. Not that Lois is an idiot, but her Earth-1 and movie counterparts had to deal with a Superman a lot more steeped in Kryptonian culture than the current version (at least so far). Both the Alan Moore Supreme stories and Grant Morrison’s All-Star Superman gave Superman a big home-court advantage, to an almost sinister degree, and this tended to keep Lois off-balance whenever she visited the Fortress of Solitude or got too involved in the Kryptonian side of things. In other words, if Clark is the disguise, it seems like a Lois who learns the secret has a lot more issues to work through in order to have a healthy relationship. That Lois can have a pretty normal relationship with Superman, because Superman is a purer expression of Kal-El’s true nature than Clark is (and, of course, she still has to come to terms with having a relationship with Kal-El). However, making Superman the disguise and Clark the “real person” seems more conducive to a relationship with Lois, because falling in love with Clark should make it easier for her to understand his role as Superman. However, it seems like we fans can either have Clark-the-disguise or a well-adjusted, full-disclosure Lois & Clark, but not both. I’m still not sure which I’d prefer. Probably the latter, because I think it makes everyone look a little better, but I still have a lot of affection for the old Clark. Who needed the glasses here…? “Superman Takes A Wife!”, from Action Comics #484 (June 1978), is one of my favorite Superman stories, odd quasi-Biblical title and all. I got the Superman in the Seventies paperback mostly because it reprinted that story. I love its retro, mature, cusp-of-the-’50s feel. I love that Curt Swan really tried to ape the period style of Wayne Boring, even though Swan’s style is iconic. Lois marries Clark never having learned that he was Superman. (Clark is still super, he’s just magically forgotten his other identity, and Superman’s been missing for a year.) 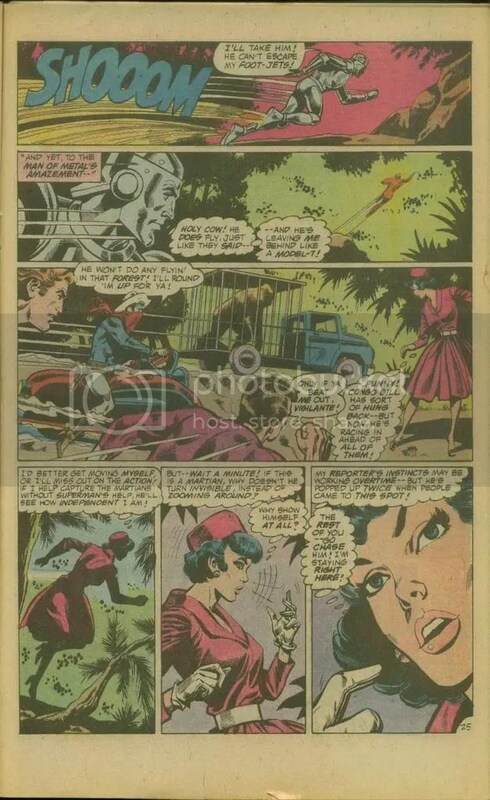 Lois’ old suspicions come back when Clark survives a machine-gun attack while swimming. Now, Lois has spent the better part of 15 years or so analyzing the differences between Clark and Superman. In fact, after Supes disappeared, Lois grew more attracted to Clark because Clark became less of a pushover. When Clark is attacked, Lois sees him swimming without his glasses. That night they sleep together, and she finally catches on — by trying to cut his invulnerable hair. Never mind that when he’s sleeping, he doesn’t have his glasses, and darn if he doesn’t look like Superman! Anyway, still a good story.